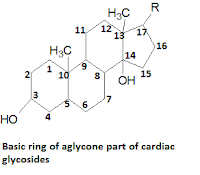 Aglycone part of the cardenolides is made up of 4 rings fused to form a ring skeleton of 17 carbon atoms. A-B & C-D rings are cis-fused whereas, B-C rings are Trans fused. There present an angular CH3 group at C-10 and C-13 position of the primary skeleton of the ring system. OH groups at C-12 & C-16 position are the distinguishing property between digoxgenin, digitoxgenin and gitoxigenin. There presents a five α-β unsaturated membered lactone ring at C-17 position of the basic ring. The OH group at C-3 of the aglycone portion usually is conjugated to a monosaccharide or a polysaccharide with β-1,4-glycosidic linkage. 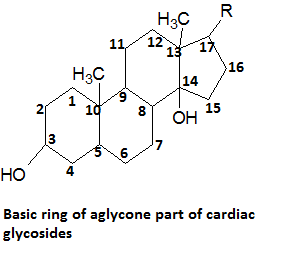 These sugars are present in the β-conformation in cardiac glycosides. i) There should be β-17 lactone ring present. ii) OH group at C-14 should also be present in β-orientation. iii) A-B & C-D rings should be essentially fused cis. Pharmacology of the cardiac glycosides is also of prime importance as they are the only class of drugs offering successful treatment of CHF. In the pharmacology, mechanism of action and drug interaction of cardiac glycosides plays an important role so should be dealt carefully. The process of membrane depolarization/repolarisation is controlled by Na+, K+ and Ca++. At resting state, concentration of Na+ increases outside the cell and after depolarization concentration of the Na+ comes inside the cell. This increased Na+ inside the cell activates the calcium channels and hence Ca++ concentration increases inside the cell and which is also responsible for the influx of K+ inside the cell. At later stage, to restore the membrane potential Na+/K+ exchange occurs by Na+/K+ ATPase pump. Cardiac glycosides block this pump and this ultimately increases the con. of Ca++ inside the cell as there is no efflux of these ions. These Ca++ ions after undergoing series of reactions enhance the contractibility of myocardial cells. More the lipophilicity of the cardiac glycosides more will be the absorption and t1/2 of the glycosides. As digoxin contains 1 extra Oh group than digitoxin so later is more lipophilic than digoxin. Due to this lipophilicity profile, absorption of digoxin is 70-80% ahereas of digitoxin is 95-100% whereas, t1/2 of digoxin is 1-2 days and that of digitoxin is of 5-7 days. Digoxin is excreted unchanged from the urine whereas; digitoxin is first metabolized to digoxin in the liver before excretion. In kidney, p-gp mediated renal tubular secretion of the digoxin do occurs but quinidine inhibits p-gp hence decrease the excretion of digoxin which can raise the plasma con. of the drug to toxic level. Verapamil decrease p-gp of intestine and hence decrease intestine excretion of the drug. Rifampin induces p-gp and hence enhances the excretion of cardiac glycosides. Thiazine and digoxin shows additive or synergism which ultimately leads to increased hypokalemia. This is what a student is expected to study in the chemistry and pharmacology of the cardiac glycosides. To study the chemical tests of cardenolides one can refer- Phytochemical screening of different classes of drugs in pharmacognosy.